Here in the belly of the beast, there is nothing but depression and attempts at justification for the Packer's loss on Sunday at Seattle. There's a lot of "oh, we played so great," and "what a great game," and "so proud of the team" that it makes me want to puke. Indeed, the team played extremely well - certainly good enough to win - but a number of individual efforts cost them a game that they absolutely had in hand. With 5:13 left in the game and the Packers up by two touchdowns, Burnett intercepts Russel Wilson at the Green Bay 39. Despite having a ton of open field around him, Burnett runs about four yards and then falls to the ground, assuming that his interception has iced the game, and that any additional field position was worthless. He couldn't have been more wrong, as Green Bay went three-and-out, and punted to the Seattle 31. After Seattle's drive and score, everyone and their brother knew they'd onside kick, and indeed that is exactly what took place. 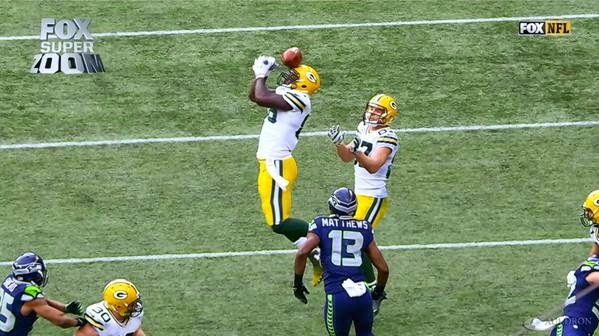 The ball literally hits Packer's TE Brandon Bostick in the face (see above), he fails to control the ball, and Seattle takes over, needing a touchdown with 2:09 and one time out left. Of course Seattle scores, and makes the game 19-20 in their favor. Since an extra point means nothing, and a two point conversion would mean that the Packers could only tie with a successful field goal in the remaining 1:25, the Seahawks go for two. On the play, Wilson scrambled for his life, and ended up tossing the ball up for grabs in desperation. Ha Ha Clinton-Dix had about a day and a half to get underneath the sky-ball and make a play. Instead, he inexplicably misplays the ball and the receiver. Seattle successful converts. Hence, what could have been a game-winning field goal for Green Bay on their subsequent drive was reduced to just a game-tying field goal. In the overtime to break that tie, Seattle won the toss, drove down the field, and scored a game winning TD, sending the Packers' faithful to their alcohol of choice. The grief of the game is still raw, and the bargaining and justification of the team's performance is occurring at an almost pathetic level. Yes, the Packers played well. But when it comes down to it, they cost themselves the game. They wrapped it up nice and pretty, and even gave Seattle a big, sloppy, girly kiss. The Seahawks gladly accepted the gift, and will pack their bags for Arizona. As for Packer Nation? There's always the memories (fuzzy as they may be), beer to drown the sorrows, and a "we'll get 'em again next year" optimism. Ah, yes, next year. Too bad they pissed away this year.